We greatly increased the capacity of Original Page. Now you can use up to 21 pages. We put the basic expressions, "Yes" "No" and "Please", on the top page for quicker and more effective communication. Those expressions have vibration to notice easier. We deleted the movie that had caused of crush. At the same time, we rearranged the program and reduced the capacity of the app. This is our 16th updating since we released this app in April 2011. Lately, cellular phones and mobile games are getting attention as assist tools for communication. Especially so called smart phones blending of a cellular phone and a PDA are attract growing interest. Big appeals of these mobile tools are not only e-mail or camera functions but also users can customize for their own convenience by installing many applications. Many assist applications for smart phones or mobile games aimed to help people who have communication disorder have already introduced. Those applications cost about $15 to $350 (1500yen to 35000yen) and provide a lot of original functions for exclusive use. But because of the high price and complicated functions, people who need communication assistance cannot make the best use of them. Therefore, we Toriken, M.Torii's laboratory of Media Information Science of Aichi Institute of Technology in JAPAN, worked on the development of a new assist tool for people who have communication disorder. We succeeded in developing an inexpensive ($2.99) and easy use application for smart phones for people who have difficulty with communication to be able to use a high-tech AAC(Augmentative and Alternative Communication) with no hesitancy. We developed this application for people with communication disorder, such as autisitics or aphasics, to feel the joy of communication. 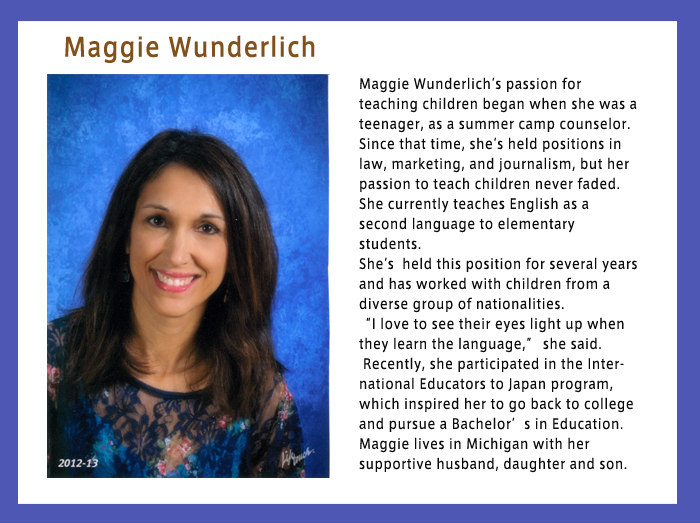 And also, little children will enjoy learning words and sentences with it. 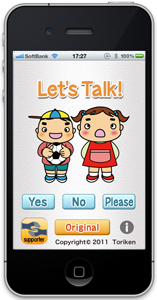 We hope this application will enhance an interest of communication for everyone. Andy B. & L. Front B. who developed PECS says it is useful to teach children basic communication to start from how to express their requests. People usually have strong need to communicate when they request something. And they really feel the joy of communication when their requests are satisfied. We focused to express basic requests such as "I want to do (something)." or "I need (something)." with simple operations. 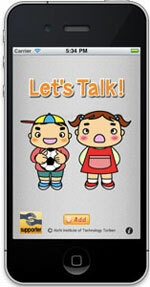 It is the big advantage of "Let's Talk!" to express a request with only one action. Children love jokes or make funny sounds. Some unique contents, such as "Jokes" and "Sounds", appeal to autistics or little children and make them feel like to use it naturally. And those contents may be a chance to communicate with other people. We discussed with teachers of a special support school who actually deal with autistic children about the situations or methods to develop this application, and narrowed down the request situations which may stimulate the desire to communicate with others. We focus on the objectives to the request situation to understand easily for both talkers and listeners. Plain and clear pictures are used for the categories and symbols to easy to understand for anyone. The volume of "Let's Talk!" is much enough to be able to hear outdoor or in a crowded place. The voice and sound is very clear to easy to listen. ■ Extend your feeling freely! "Let's Talk!" has about 120 icons which fit our daily life, but more icons may be required depending on the user's situation. On the other hand, if you have too many icons most of which are useless, it will take much time to choose an icon you really want to show and avoide the easy opperation. The "Create" page will provides you more effective communication without confusion. 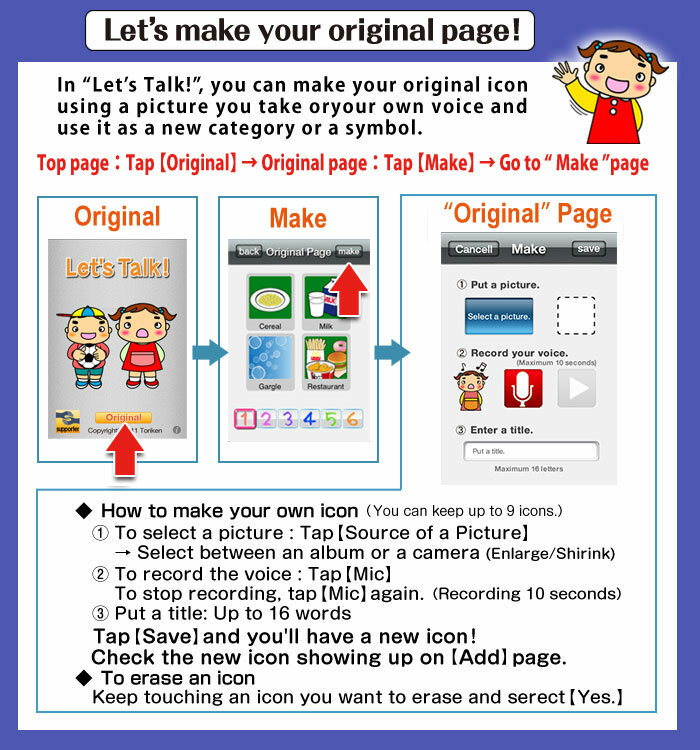 On "Create" page, you can make your own icons with a camera or a voice recorder your smart phone has. You can expect easy and quick communication with those original icons of your own! You can customize an original page by arranging icons you make with the camera function or existing symbols. 4) [Save] You have your original icon! it will be added on the "Original page". "Let's Talk!" has 2 modes. 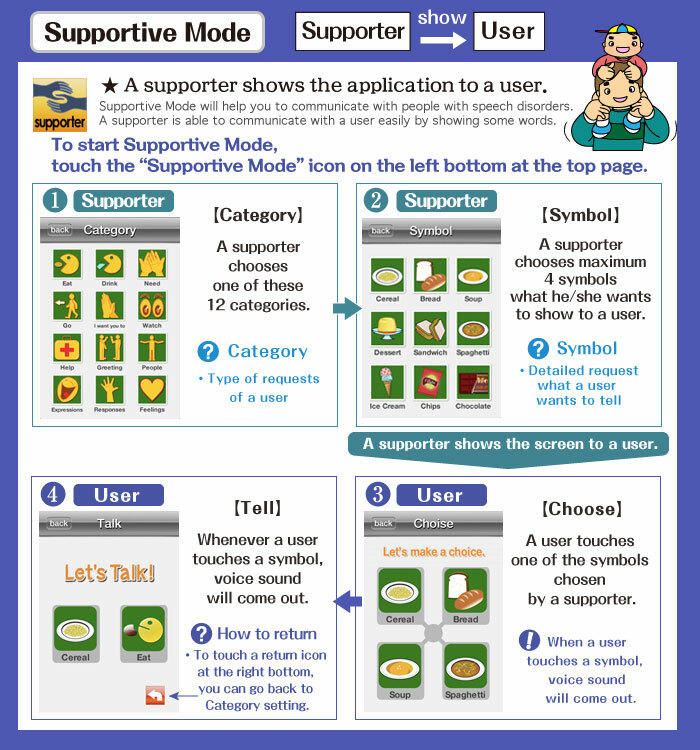 On "Supportive Mode", a supporter who helps a person who has a disability starts to communicate with him/her. 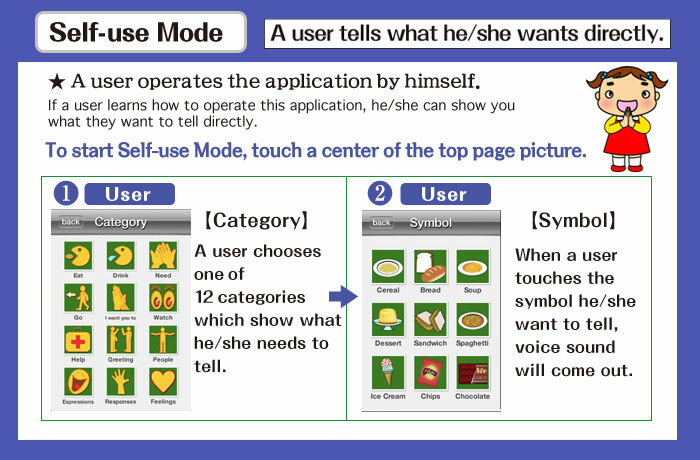 On "Self-use Mode", a person who has a disability can show his/her request by voice with this application. It is difficult for people with significant intellectual challenges to choose what they really need to say among too many choices. On Supportive Mode of the application, a supporter picks symbols fitting to the situation and the condition of a user who needs assistant for communication first. Then a user can make a choice which is suitable for his/her request easily. To limit the numbers of symbols picked by a supporter from 1 to 4 makes it easy to choose and fulfills a simple operation for a user. When a user touches the symbol what he/she wants to tell, a simple 2 words sentence comes out by voice sound and it will help to communicate with others easily. If a supporter guesses a user want to eat something. 1)	A supporter chooses "Eat" among 12 categories. "cereal","bread","soup","spaghetti" and shows it to a user. "I want to eat cereal." tell what he/she wants directly with categories or symbols by Self-use Mode. Wide reacting area makes it easy to operate for people with disabilities. If a user shows he/she wants to eat something. 1)	A user chooses "Eat" among 12 categories. 2)	A user touches what he/she wants to eat ="cereal". 3)	The voice sound says, "I want to eat cereal."